There are several stages to buying a Lagotto puppy once you have decided that it is the right breed for your family. A Lagotto is an affectionate animal, it forms a close bond with its owner and also makes a fine, easy-to-train companion if the owner is prepared to commit to structured training. A medium sized friendly dog, with an appealing face and happy smile, but do not be deceived, these are not the easiest of family pets and not necessarily the best choice for a first time dog owner. Bear in mind that you are buying a working dog, whose Italian ancestry is a typical farmyard dog, used only to working and living outside, not a breed with many generations of domestication behind it. Left to their own devices and without purpose, they will become bored and naughty. They need to work or be occupied. Coats are hypo allergenic, but definitely have to be regularly groomed to prevent matting and the occasional clip-out helps to keep a Lagotto comfortable. Unless you can learn to do this yourself, you will need to factor in the costs of a Dog Grooming Parlour into your routine expenses. Firstly, you need to find a reputable breeder. The Kennel Club has a list of Assured Breeders and they should always be your first port of call, as such breeders have demonstrated that they are being responsible in their breeding practices. Because there are so few ABS Lagotto breeders, inevitably all will have a waiting list for their puppies. Lagotto puppies are few and far between, so the trick to getting a puppy is to get your name on waiting lists and, above all, be patient! If you have a colour or gender preference, you might have to wait even longer, so try not to be too specific. Above all else, temperament is more important than colour. Please see the following link for further information about the Kennel Club's Assured Breeders programme. You might also be lucky to find a breeder via a Breed Club listing, personal referral or on a commercial website. Whilst there are genuine breeders out there, please be careful with this approach as no guarantees can be given as to reputation or breeding practices. 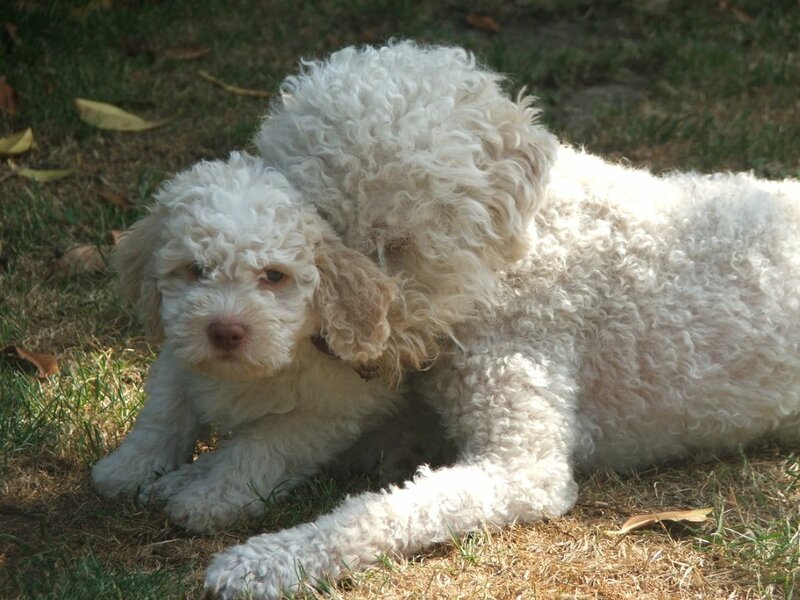 There are far more Lagotto breeders in Europe and, following revisions to the Pet Passport scheme, it is now fairly easy to bring a puppy into the UK at around 16+ weeks. It doesn’t matter where your puppies comes from, you should still ask the same questions, as per the following guidance. When the breeder lets you know there are puppies available, it may be that the litter is not old enough for you to see, and it is quite likely not old enough to take home. Many breeders encourage new owners to visit several times as the puppies are growing. This gives time for you to ask any questions you may have and to see the mother interacting with them. It also gives you time to be certain that a Lagotto is really the breed for you. Also expect to be thoroughly “vetted” by the breeder to determine your home life is suitable for a Lagotto puppy. A responsible breeder will ask many questions of you before they agree to sell you a puppy. When you visit, you should see the puppies in their normal environment. They should not be brought to you from a different part of the premises. They should be kept in clean accommodation and be pleasant to handle. You should see their mother with them, she should show no sign of fear or aggression to you and the puppies should be confident, out-going and be happy to meet you and not be nervous or withdrawn. Please ask to see a copy of the puppy’s pedigree and parent’s health certificatesat an early stage. Because the UK gene pool for Lagotto is very small, some dogs are “closely bred” which means they are the offspring of close family member matings. The LRA maintains a database of al UK registered Lagotto, and if you have concerns about a pedigree, then please contact the Secretary for further information. Apart from all the standard paperwork you will get when you collect your puppy, most responsible breeders will also have their own sales contract. This should be given to you in advance of you collecting your puppy, so that, as with any other type of contract, you are given the chance to read and digest its contents before signing and to ask any questions you consider relevant. Do make a point of asking for a copy during one of your early visits, as it avoids any misunderstanding at a later stage. You should be aware that many breeders place restrictions on their puppies for breeding and export purposes. Such restrictions and any associated conditions should be thoroughly explained to you and understood before any contract is signed. When you take your puppy home, you should get a diet sheet, a supply of the food they have been reared on, details of when and how the puppy has been wormed and a copy of the pup’s pedigree. Your new puppy may have also been micro-chipped or vaccinated already. Before you collect your puppy you should ask the breeder if the following documents will be available on the day: microchip/vaccination documents and the Kennel Club Registration document (which should be signed on the back by the breeder). If any of these things are not readily available, you will need to satisfy yourself as to the reasons why. Just because they are advertised as Kennel Club registered does not mean the breeder is not a puppy farmer. Please ring or email for advice if you have any particular concerns. You should sign the Registration Document on receipt and send it with the relevant fee to the Kennel Club to have the registration of ownership transferred from the breeder’s to your name. It is recommended that you insure your new puppy. This is often a condition of sale but is intended to protect you from any unexpected expenses. The parents may have been checked for the following hereditary diseases. You should ask the breeder to show you or supply copies of the official test result certificates as appropriate. The table below details the current diseases and conditions in Lagottos for which there are certified/official health/DNA tests. Please remember that the only way a breeder can be sure their breeding stock does NOT have any of these conditions, is by confirmation by testing and they will have official notifications of the outcomes to prove the status. As with any considered purchase, it must always be buyer beware. If a breeder says that they don't do particular testing because they "don't have a problem" consider that they can't be sure without having test results to substantiate this claim. Hip Dysplasia - The best score possible is “0” the worst is “106”. This test should always be done before breeding occurs. It is recommended that neither parents should be higher than 18, or the equivalent; as the score increases, the risk of HD increases. Elbow Dysplasia - This is a new scheme launched in 1998, the best is “0” worst is “3”. This a recommended test, but not essential test. Juvenile Epilepsy – A kind of epilepsy which usually manifests itself as symptoms in early age. Juvenile epilepsy is genetically imprinted and may occur during week five to twelve of a puppy’s life, but sometimes much later. Typically, symptoms range from slight shivering and wobbly gait to spastic paralysis, or the dog being unable to walk. Genetic testing offers an opportunity to prove the existence of the disease, despite the short time these varying symptoms appear. Below is a table, demonstrating the genetic variations possible. Clear - The dog is a non-carrier of the mutant gene. The dog will never develop Juvenile epilepsy and therefore it can be bred to any other dog. Carrier - The dog carries one copy of the mutant gene and one copy of the normal gene. The dog should never develop Juvenile epilepsy but since it carries the mutant gene, it can pass it on to its offspring with the probability of 50%. The following laboratories provide genetic testing for Juvenile Epilepsy. Responsible breeders should be able to show you certificates to demonstrate the status of their puppies either because the parents or ancestors have been tested, or that the puppies have been individually tested. Remember that in genetics, there are no guarantees. Breeders can only doe their best to rear healthy puppies. Breeders should be prepared to help with any problems you may experience. They should be responsible for all litters they breed. Many will insist on the dog being returned to them if you are unable to keep it and/or will help in the rehoming, or should at least be informed should ownership change. This is often embodied in a sales contract. The Lagotto Romagnolo Association makes no warranty as to the quality or fitness of any puppies offered for sale and can accept no responsibility for any transaction between the purchaser and vendor.